Sacred object handed back to Hopi tribe after ‘shameful’ Paris auctionIn a historic handover ceremony, an object sacred to the Hopi people has been returned to Hopi after dozens of katsinam (‘friends’) were sold at a Paris auction house in April 2013 despite repeated requests and litigation. 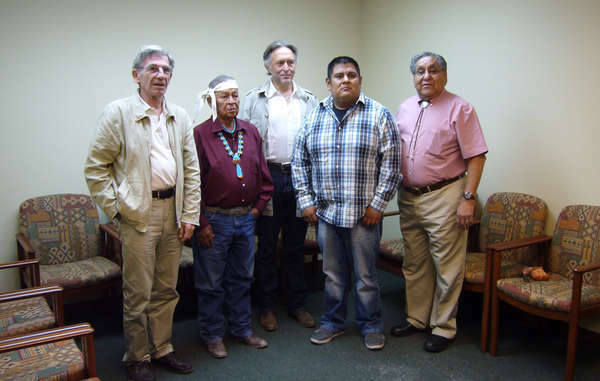 Representatives of tribal rights organization Survival International and lawyer Pierre Servan-Schreiber returned the katsina to Hopi. A second katsina was acquired by the family of the deceased French singer Joe Dassin, and will be returned to the Hopi later this year.Comment: For more on the subject, see Auction House Sells Hopi Masks and Auction House vs. Hopi on Masks. Below: "The katsina was handed over to Hopi chairman and religious leaders by lawyer Pierre Servan-Schreiber and Survival International's Jean Patrick Razon (no photography was allowed during the handover itself)." The judge rejected Servan-Schreiber's argument the morning of the auction. He declined to join an associate and Survival International official at the sale that afternoon. He said his attendance "would be considered provocation." Instead, he gave them money from his own pocket to purchase a mask so that he could "return it to the Hopi if I can." Servan-Schreiber paid $7,845 for one of the masks, and met with Hopi leaders and tribal members last Friday to deliver it. In all, the relics sold for more than $1.2 million, the Agence France-Presse reported.